The big news for the 2013 Ford SUV, truck and van lineup is the debut of the redesigned 2013 Escape compact crossover SUV. Ford makes no changes to its E-Series and Transit Connect vans, while the F-Series full-size pickups receive minor enhancements including new luxury trim levels and MyFord Touch infotainment systems designed to be user-friendly for truck owners. The updated MyFord Touch technology is also available on the Edge, new Escape, and the Explorer. The 2013 Explorer is available with new safety features and gains a new Sport trim level complete with the Taurus SHO's twin-turbocharged all-wheel-drive powertrain. The Ford E-Series Van and Wagon are full-size cargo and people haulers sold in E-150, E-250 and E-350 series models with a standard- or extended-length body and up to 15-passenger seating capacity. The E-350 also offers multiple wheelbase choices. Wagons are available in XL and XLT trim, while vans can be outfitted with commercial or recreational equipment. The E-Series is due to be replaced soon by the all-new Ford Transit. The Ford Edge is a 5-passenger midsize crossover SUV equipped with front- or all-wheel drive. Buyers can choose SE, SEL, Limited or Sport trim levels, and the Edge is offered with three different engines, the most powerful of which is reserved for the Sport trim. The Ford Escape is completely redesigned for the first time since it first debuted for the 2001 model year. From the tires to the roof, and the powertrains to the hands-free power tailgate, this compact crossover SUV is completely new. The lineup includes S, SE, SEL and Titanium trim levels with front- or all-wheel drive and a choice of three 4-cylinder engines, including two that are turbocharged. The Ford Expedition is a full-size, 8-passenger SUV available in regular- and extended-length models. Built for hauling and towing, the Expedition can handle up to 9,200 pounds of trailer weight and provides up to 130.8 cubic feet of cargo capacity. Because it has an independent rear suspension, the Expedition's third-row seat folds into the floor and never needs to be removed. The Ford Explorer is a 7-passenger crossover SUV sold in standard, XLT, Limited and Sport trim levels, the latter a new entry for 2013. Front-wheel drive is standard, with all-wheel drive optional. Buyers can choose a turbocharged 4-cylinder, V-6, or twin-turbocharged V-6 engine. Ford refines its F-150 full-size light-duty pickup truck for 2013. The F-150 continues to be offered in three cab styles and bed lengths with a choice of four powertrains and eight trim levels. Maximum towing capacity is 11,300 pounds and maximum payload capacity is 3,120 pounds when properly equipped. The F-250, F-350 and F-450 pickup trucks are Ford's heavy-duty models, available in regular-, extended-, and crew-cab styles with a choice of bed lengths and single or dual rear wheels. Trim levels include XL, XLT, Lariat, King Ranch and a new luxury-oriented Platinum version, powered by either a gasoline or turbo-diesel V-8 engine. Maximum towing capacity is 17,500 pounds with a conventional hitch, and maximum payload capacity is 7,110 pounds when properly equipped. 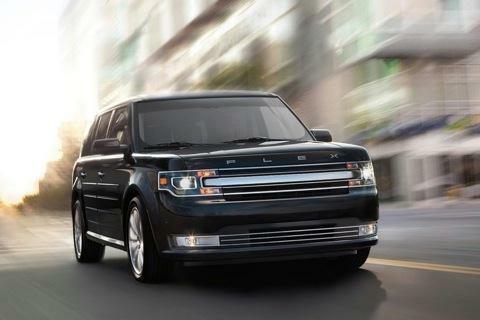 The Ford Flex is a large crossover SUV that can carry up to 7 passengers in three rows of seats. Sold in SE, SEL and Limited trim levels, the Flex can also be equipped with a Titanium trim package that provides a unique vehicle appearance. A 287-horsepower, 3.5-liter V-6 engine is standard, delivering power to the front wheels or all four wheels. A twin-turbocharged 3.5-liter V-6 engine with 365 horsepower is optional, and is equipped with all-wheel drive only. The Ford Transit Connect is a compact van designed for commercial use in cities. It is available in cargo and passenger variants. Buyers can choose between gasoline and electric versions, and the Transit Connect can be converted to run on compressed natural gas (CNG) or liquefied propane gas (LPG). Electric versions provide an estimated range of 80 miles. Maximum cargo space measures 129.6 cubic feet with a 6-foot load floor, and the Transit Connect can handle up to 1,600 pounds of payload.